August 25, 2015 Robert A. Weigand, Ph.D.
Analyzing returns to stocks by sector can reveal information about investors’ desire to either take on or avoid additional risk exposure. 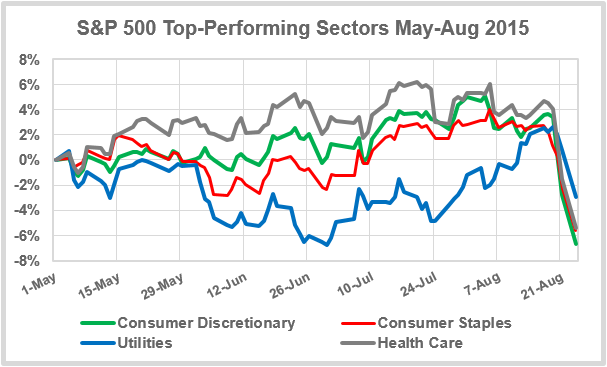 The chart below shows that the top-performing S&P 500 sectors since May 2015 include defensive sectors such as Utilities, Consumer Staples and Health Care. Investors typically rotate into these safer sectors when they anticipate increased market volatility and sluggish economic conditions, which turned out to be a good call. It’s definitely been a “sell in May and go away” summer thus far. 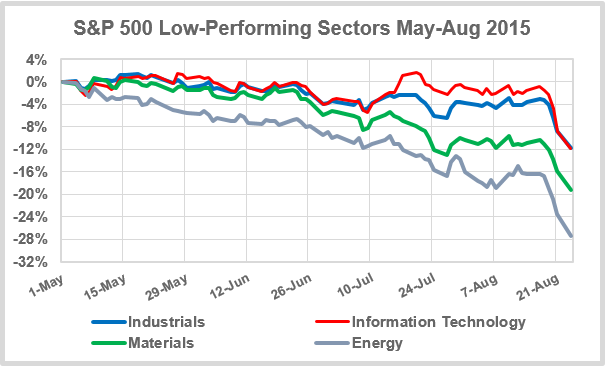 The worst-performing S&P 500 sectors include Industrials, Information Technology, Materials and Energy stocks. Investors typically rotate into these stocks when they anticipate lower market volatility and brisk economic activity. The continued decline in Materials and Energy raises the possibility that these sectors are now somewhat oversold, with the chance for a potential “relief rally” later in the year. The chart below shows the CBOE’s implied volatility index (VIX), sometimes called the “fear index,” although when volatility languishes as it has for most of the past 4-year rally in stocks, it can also be thought of as a “complacency index.” The spike in volatility from August 24 rivals those from early 2010 and late 2011, but is still much lower than the volatility observed in late 2008 and early 2009, during the heart of the financial crisis. If the VIX quickly returns to a sub-20% reading, it would signal a return to more of a “risk-on” mentality in Q3. On the other hand, stocks are unlikely to begin a significant uptrend if the VIX remains elevated. Overall, sector activity shows that investors had been positioning themselves for a steep correction since May. Whether or not the selling continues into bear territory or remains confined to a quick correction likely depends on the Federal Reserve’s September interest rate decision. If the Fed hesitates and postpones their long-telegraphed rate increase, expect stocks to rally sharply this fall — especially the most beaten-down sectors. If the Fed proceeds and raises rates in September, however, the recent increase in volatility is likely to continue, and a sustained market rally is much more unlikely. Data from S&P’s Capital IQ.